There is considerable policy concern and controversy about whether new regulations such as those in Basel III could have a negative effect on SME access to finance. Addressing these questions is a natural follow-on to the contributions in the first issue of European Economy – Banks, Regulation, and the Real Sector on “Capital Requirements for Large Banks”. The lead article in that issue highlights the tension between regulatory changes instituted after the beginning of the crisis (to decrease bank leverage and increase capital buffers) and the banking industry’s contention that this will reduce the incentive to lend (Barba Navaretti, Calzolari and Pozzolo 2015). In a world in which the relevance of a bank’s capital structure is still in debate, it is not surprising that the effect of changes in a bank’s capital structure is, likewise, in debate. As Barba Navaretti, Calzolari and Pozzolo (2015) emphasize, in the Modigliani and Miller version of the banking world reflected in Admati and Hellwig (2013), bank capital structure is irrelevant and meeting the new regulatory requirements should not be problematic for banks. But, as other contributors to the journal’s first issue (Beck 2015, Clerc 2015 and Rochet 2015) point out, market frictions likely punch a significant hole in the bank capital irrelevance argument and, thus, the stringent new banking regulations could have a meaningful effect on bank lending. I refer the reader to these articles in the first issue of the journal for a detailed discussion of the arguments and evidence that the overall cost of lending will likely increase and credit availability will likely contract because of these new regulations. To summarize, however, Beck (2015) concludes that a majority of the research suggests only a modest effect on the cost of funding and on investment and aggregate output. But, Clerc (2015) also notes that some recent papers show that the short and long term costs of higher capital requirements would be higher than those estimated in the MAG exercise and that there may be an optimal requirement with respect to their effect on real economic activity. These studies, however, are predictive in nature. A very recent study on the Swiss implementation of the countercyclical capital buffer offers the first assessment of the actual implementation of Basel III – specifically, the implementation in Switzerland of one component of Basel III, the countercyclical capital buffer (CCB) (Basten and Koch 2015). Switzerland was the first country to adopt the Basel III countercyclical capital buffer (CCB) by implementing it in February of 2013. This paper uses a unique loan level dataset on loan offers to analyse the impact of the CCB on mortgage pricing. One of the most interesting results in this paper is that the effect of the implementation of the CCB on mortgage offer rates was higher (on average 2.72 bp) for capital-constrained banks. This result suggests that the impact of new capital requirements on a given bank will depend on its initial capital condition. Thus, banks that are still recovering from the effects of the financial crisis might constrain their SME lending more than banks that are not. Let’s now focus specifically on how the new regulations might affect SME finance. Several papers have attempted to empirically quantitative the future impact of Basel III on SMEs using pre-implementation data. (For a nice review of the impact of Basel II on SME access to finance, see Cardone-Riportella et al. 2011.) Based on French SME micro data Humbolot (2014) finds that Basel III will likely have some effect on SME access to finance. But, the effect will depend on the regulatory treatment of the loan (e.g., whether the bank uses the Standardized or IRB approach and whether it categorizes the loan as corporate or retail) and the risk-return profile of the loan category. Using micro loan data on Spanish SMEs Cardone-Riportella et al. (2011) calculate credit risk premiums under Basel III. While for some categories they find only modest increases in the credit risk premiums (e.g., small firms in the highest rating category and SMEs guaranteed by loan guarantee associations), for other categories they find higher credit risk premiums (e.g., low rated corporates). The incremental increase in the credit risk for Basel III over Basel II, however, is found to be generally quite modest for all categories of SME loans. What other factors are likely to determine the overall impact of the new requirements on SME access to finance? In order to answer this question, it is helpful to put SME finance into a broader context. I find that the lending channel paradigm is quite useful in that regard. This paradigm was first introduced in Taketa and Udell (2007) and subsequently updated in Udell (2009) and Udell (2015). The lending channel paradigm combines the concept of lending technologies (e.g., Berger and Udell 2006) with the type of institution that offers the technology. The universe of lending technologies includes relationship lending, financial statement lending, asset-based lending (aka discounting in Ireland and the U.K.), factoring, equipment lending, leasing, real estate-based lending, small business credit scoring, crowd funding and trade credit (see Figure 1). Each of these lending technologies represents a “unique combination of the primary source of information, screening and underwriting policies/procedures, structure of the loan contracts, and monitoring strategies and mechanisms” (Berger and Udell 2006). These lending technologies are either “relationship-based” or “transactions-based”. We can also think of them as being either primarily targeted to relatively opaque SMEs, relatively transparent SMEs, or both. For example, relationship lending would be targeted to relatively opaque SMEs, while financial statement lending (which requires verified/audited financial statements) would be targeted to relatively transparent SMEs. And, we can think of them in terms of the primary source of information on which they are based, i.e., “soft” information vs. “hard” information. Unlike hard information, soft information is not easily quantifiable and transmitted within the hierarchy of a financial institution (Stein 2002). The lending channel paradigm builds on the concept of lending technologies by linking each of the technologies to the type of institution that offers them within a given country. Each combination represents a “lending channel” through which funds can flow to SMEs within a given country. Let’s use the U.S. as an example because it is a country in which all of these lending technologies exist. shows U.S. lending channels today. The columns represent the institutions in the U.S. that provide financing to SMEs. The rows indicate the lending technologies. 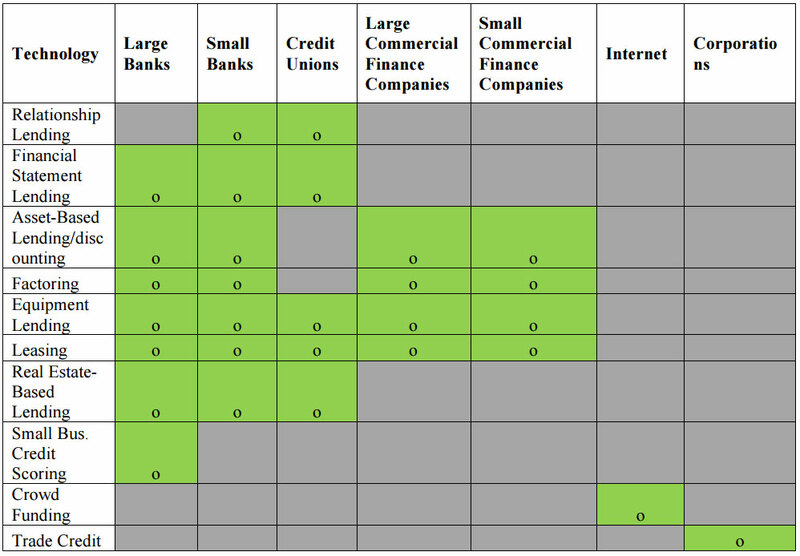 The cells (i.e., the channels) link the lenders with the technologies they offer: an “o” indicates an operative lending channel and the grey shaded boxes indicate that this type of financial institution does not offer that lending technology. For example, large banks and commercial finance companies do not offer relationship lending but small banks and credit unions (and credit cooperatives in many European countries) do. The special role of smaller depository institutions in providing relationship lending is supported by the bulk of the theoretical and empirical evidence (e.g., Stein 2002, Berger et al. 2005). However, the evidence also shows that large banks are very active in providing transactions-based lending to SMEs (e.g., de la Torre, Peria and Schmukler 2010). And, this is reflected by the large number cells linking large financial institutions to transactions-based lending technologies. Now we can see how the lending channel paradigm is a useful tool in thinking about shocks to a financial system – including a regulatory shock such as Basel III. Basel III could very well contract some of these lending channels. Specifically, Basel III could affect the lending channels in Europe that are provided by banks. But, non-bank channels should not be negatively affected. Moreover, some of these nonbank channels may actually expand in response to SMEs seeking alternative sources of funding. For example, large corporations might increase their provision of trade credit to affected SMEs. (There is some evidence that increases in trade credit may have partially offset the effects of another type of shock, the credit crunch in Europe and the U.S. during the recent crisis (Garcia-Appendini and Montoriol-Garriga 2013, Carbó-Valverde, Rodríguez-Fernández and Udell 2014). Or, commercial finance companies might increase their lending/factoring to European SMEs. To the extent that nonbank channels offset a negative Basel III effect on bank channels, then Basel III’s impact will be at least partially mitigated. This leads us to another useful feature of the lending channel paradigm. It highlights the fact that the lending channels differ significantly across countries (and across time). For example, Central and Eastern European banking systems are dominated by foreign multi-nationals. So, the lending channel paradigm can be adjusted to reflect a distinction between domestically-owned banks and foreign-owned banks. For example, if we were to construct a lending channel diagram for Croatia, it might look like Figure 3. How these multi-national banks behave in their foreign lending in response to Basel III will likely depend on whether they are capital constrained and whether they behave differently “away from home” (Ongena, Popov and Udell 2013). Another example is asset-based lending which exists in Ireland and the U.K. but does not yet exist in continental Europe. Non-bank asset-based lenders may mitigate a Basel III effect on SME finance in these two countries. Also, because the economic importance of crowd funding likely varies significantly across Europe, its potential to mitigate Basel III effects will be different depending on the country. In short, concern over the effect of Basel III is not without some justification. I would argue that the lending channel paradigm offers a useful way of framing the issue. At the country level it highlights the fact that the ultimate effect will depend on how the individual lending channels behave. It also highlights the importance of the net effect – the extent to which the contraction of some channels may be offset by the expansion of others. And, finally, it emphasizes that there may be important differences across countries that determine the net effect between contracting and expanding channels. It is widely agreed that these guarantee programs are designed to: 1) address market imperfections that can lead to a funding gap; and 2) spur innovation in the SME sector – the sector where innovation matters the most (e.g., Hancock, Peek and Wilcox 2007). Unsettled in the academic literature is whether the programs are on balance welfare improving, or welfare diminishing. They might actually be diminishing because of unintended consequences associated with engendering adverse selection and moral hazard problems. Some research, indeed, indicates that the problems created by guarantee programs are greater than the problems that they are intended to solve and that credit allocation should therefore be left to the market (De Marco 2002). However, it is my sense that the balance of the literature argues in favour of these programs. That is, guarantee programs appear to generate positive net benefits including increased real economic activity (e.g., Craig, Jackson and Thomson 2005, Hancock, Peek and Wilcox 2007), decreased pro-cyclicality of SME lending (e.g., Hancock, Peek and Wilcox 2007) and mitigation of the effects of macro shocks (e.g., Uesugi, Sakai and Yamashiro 2006, Wilcox and Yasuda 2010). 3. Securitization of SME loans: Can securitization improve SME access to finance? In the context of the lending channel paradigm, securitization is the other key credit multiplier. Securitization’s birth occurred with the first mortgage backed security (MBS), the GNMA pass-through, offered in 1968. After its introduction securitization of residential mortgages expanded rapidly ultimately culminating in subprime MBS. Securitization spread to other instruments including, for example, commercial real estate mortgages, auto loans, accounts receivable, and music industry royalties. Not surprisingly, there has been considerable interest in securitizing commercial loans – particularly SME loans – that can be traced back at least three decades. Moreover, policy interest in securitizing SME loans has been particularly strong in Europe recently. Policymakers point to a number of benefits: a useful bank funding tool; an alternative to bank funding; bank portfolio diversification; liquidity; and, macro-prudential benefits from transferring risk away from the banking sector (e.g., BoE-ECB 2014). Moreover European policymakers have been proactive in expanding the SME securitization market including the November 2014 ECB introduction of the Asset-backed Securities Purchase Program (ECB 2014). Today SME securitization in Europe represents about 10% of total SME outstandings – a percentage much larger than in the U.S. (Altomonte and Bussoli 2014). However, there is considerable variation across countries. Also, there has been a significant decline in the volume of SME asset-backed security (ABS) issuance since the crisis and the secondary market has been moribund. Perhaps more telling, however, is the fact that nearly all (90%) of the current SME ABS are retained on the balance sheets of the issuing banks (i.e., it does not trade) (Altomonte and Bussoli 2014) and where it can be posted as collateral with the central bank. The current European situation raises interesting questions: What is the extent to which the European SME ABS market emerged endogenously as a private market? Would the SME securitization market have been as large in the absence of government support programs in big issuers like Spain? And, can all types of SME loans (e.g., all lending technologies) be securitized? Or, will SME securitization be limited to amortizing loans secured by tangible assets (e.g., equipment, real estate)? If we look to the U.S. experience, the answers to these questions are not encouraging. Despite much enthusiasm, particularly in the 1980s, securitization of SME loans in the U.S. has been quite limited. Specifically, SME loan securitization in the U.S. is virtually entirely limited to the federal government’s Small Business Administration (SBA) loans, particularly the SBA’s 7(a) guarantee program (Berger and Frame 2005). In other words, the attractiveness of SME loans as a securitizable class of assets appears to be substantially (if not solely) due to the government guarantee associated with the underlying asset and to the standardization of these loans by SBA policy (Wilcox 2011). However, “indirect” securitization may be far more economically significant. Indirect securitization involves the securitization of a loan on an asset owned by the entrepreneur such as a residential mortgage or credit card receivable where the proceeds from these loans are used by the entrepreneur to provide financing for her business. A lack of data make it difficult to estimate the importance of indirect SME securitization in the U.S., but one estimate puts it at as high as 20% of SME debt in the U.S. (Wilcox 2011). All things considered, the European and U.S. experience suggests that a healthy scepticism about the upside of direct SME securitization as a significant credit multiplier and a solution to the SME funding gap may be in order. Many SME loans are tailored financial contracts requiring extensive monitoring and renegotiation flexibility. Thus, it may be too difficult to securitize relationship loans, more complex SME loans that are used for working capital purposes (i.e., lines of credit and overdraft facilities), or longer term loans that are covenant rich and require extensive monitoring. But, it may be feasible to securitize smaller loans that are generic in nature, benefit little from monitoring, collateralized by tangible assets and are amortizing. More fundamentally, the limited success of SME loan securitization to date may reflect a natural tension between intermediated finance and market-based finance. The theory of financial intermediation suggests a special role for banks and other financial intermediaries in providing finance to opaque SMEs. It may turn out that the type of SME securitization that we ultimately observe in Europe and the U.S. is the exception that proves the rule: only the smallest, most generic and the most standardized transactions-based loans ultimately get successfully securitized. Time will tell in Europe. Perhaps the two most interesting alternatives to bank financing are venture capital and crowd funding. Turning first to venture capital it is important to note that the venture capital market is very much an intermediated market. Consistent with the theory of financial intermediation, venture capitalists act as delegated monitors by extending equity finance to opaque start-up firms. In doing so they intensively screen prospective portfolio firms, they design complex tailored contracts at origination and then they intensively monitor these firms until they harvest them (i.e., the exit their investment via an IPO, and M&A or a write-off). Arguably the level of intensity of these activities is even higher than in banking. So, when venture capitalists fail to monitor effectively, the market disciplines them (Tian, Udell and Yu 2015) just like the banking market disciplines banks who fail to monitor (Dahiya, Saunders, and Srinivasan 2003). There has been a considerable amount of discussion about the future of venture capital in continental Europe and why it remains relatively nascent and has less of a technology orientation than the U.S. In that regard, it is important to note that the rapid growth of the venture capital industry in the U.S. was facilitated by an interesting confluence of conditions that existed at the time of its birth in the 1980s. First, the U.S. had large reservoirs of capital in the form of private (and public) pension funds and endowments. Second, changes in the early 1980s in the law that defined “prudent” investing for a fiduciary (i.e., the prudent man rule) permitted these institutions to invest in venture capital funds for the first time. And, third NASDAQ emerged as a technology oriented market that provided an important vehicle for venture capital exit. The demand side for venture capital (i.e., the level of entrepreneurship) is also important and may differ significantly between Europe and the U.S. Interestingly, there are significant differences in VC activity across Europe. A small academic literature has analysed cross-country determinants of these differences. One recent study finds that the exit environment – particularly the strength of the M&A market – is quite important. This is interesting because in general the relative importance of the M&A exit versus the IPO exit is much greater in Europe than in the U.S. (Felix, Pires and Gulamhussen 2013). To the extent that the European venture capital industry is migrating toward a U.S. model, a cautionary note may be in order. Some observers believe that the U.S. venture capital model is “broken”. I am specifically referring to the intermediation model where venture capital is extruded through a venture capital fund set up as a limited partnership. Under this partnership arrangement the capital gains are split between the general partners (the VCs who manage the fund) and the limited partners (who fund the partnership): the general partners get 20% of the capital gains and the limited partners get 80%. One recent study has found that VC returns (i.e., returns to the limited partners that provide the funding) haven’t significantly outperformed the market since the 1990s (Mulcahy, Weeks and Bradley 2012). Now turning to crowd funding: this new transactions-based technology was introduced about 10 years ago. It can take the form of debt or equity. Equity crowdfunding received a big boost in the U.S. with the passage of the JOBS Act after the financial crisis that allowed for wider investor participation. Crowdfunding platforms allow entrepreneurs to fund their enterprises via the internet tapping small individual investors. While the growth of crowdfunding has been rapid, it is still too early to tell whether this technology will ultimately be economically comparable to traditional forms of debt and equity SME financing such as bank loans, venture capital or angel finance. While there have been a few academic studies on some aspects of crowdfunding (e.g., studies of lending biases (Ravina 2008, Pope and Sydnor 2011) and the presence of default information in excess of the hard information associated with the listing (Iyer et al. 2009)), more research is certainly needed. The biggest unanswered question in my mind is the issue of how to reconcile crowd funding with the information-based theory of financial intermediation. As I noted earlier, this theory argues that intermediaries like banks and venture capital funds are economically important because they act as delegated monitors in providing funding to opaque SMEs. Crowdfunding, however, is based on the premise that intermediaries are unnecessary – that is, crowdfunding is a form of disintermediation. One possible reconciliation is that the internet itself has created alternative channels of information production. Some evidence suggests that online friendships – internet “friendships” – can mitigate adverse selection and asymmetry in a crowdfunding venue (Lin, Prabhala and Viswanathan 2013). Alternatively, crowdfunding may ultimately play a role that is similar in economic importance to small business credit scoring (SBCS) whose scope is generally capped at relatively small loans (e.g., below $100,000). SBCS reflects a very low cost screening mechanism but offers little in the way of monitoring and renegotiation. Likewise, the chief advantage of crowdfunding may also be related to its low origination costs (i.e., low screening costs) – alternative information channels notwithstanding. And, like SBCS, crowdfunding mostly ignores the monitoring side. If so, then economies of scale in funding size (i.e., economies of scale in information production) may work in favour of crowdfunding for small amounts but work in favour of traditional intermediation (e.g., banks and venture capital funds) for larger amounts were more costly screening and monitoring can be amortized over a larger deal size. While SME access to finance has long been a frontline policy issue, the intensity of interest in this topic has never been higher. This article considers several of the most interesting issues surrounding SME access to finance in a European context. These issues are related to government, regulatory and market forces. The article uses the lending channel paradigm as a useful prism with which to conduct this analysis. In particular the article uses this prism to consider the impact on SME access to finance from: the introduction of Basel III, government guarantee schemes, SME securitization, and the spread of venture capital and crowd funding in Europe. Altomonte, C. and Bussoli, P., 2014. Asset-backed securities: The Key to Unlocking Europe’s Credit Markets? Bruegel Policy Contribution, Issue 2014/07 (July). Bank of England-European Central Bank (BoE-ECB), 2014. The Case for a Better Functioning Securitization Market in the European Union (May). Barba Navaretti, G., Calzolari, G., and Pozzolo, A., 2015. The Tangled Web: Do Capital Requirements and Loss Absorption Capacity Foster a Systemic Risk Free, Pro-growth Banking Environment? European Economy – Banks, Regulation, and the Real Sector, Year 1, Issue 1, pages 9-24. Basten, C. and Koch, C., 2015. Higher Bank Capital Requirements and Mortgage Pricing: Evidence from the Countercyclical Capital Buffer (CCB). BIS Working Paper No. 511. Beck, T., 2015. Bank Capital – Panacea for a Crisis-Free Banking System? European Economy – Banks, Regulation, and the Real Sector, Year 1, Issue 1, 47-58. Berger, A.N., Miller, N.H., Petersen, M.A., Rajan, R.G. and Stein, J.C., 2005. Does Function Follow Organizational Form? Evidence from the Lending Practices of Large and Small Banks. Journal of Financial Economic 76, 237-269. Berger, A.N, and Frame, S., 2005. Small Business credit scoring and credit availability. Federal Reserve Bank of Atlanta Working Paper. Berger, A.N., and Udell, G., 2006. A More Complete Conceptual Framework for SME finance. Journal of Banking Finance 30, 2945-2966. Carbó-Valverde, S., Rodríguez-Fernández, F., and Udell, G., 2014. Trade Credit, the Financial Crisis, and SME Access to Finance. Journal of Money, Credit and Banking (forthcoming). Clerc, L., 2015. Higher Capital Requirements for GSIBs: Systemic Risk vs. Lending to the Real Economy. European Economy – Banks, Regulation, and the Real Sector, Year 1, Issue 1, pages 87-93. Craig, B., Jackson III, W.E., and Thomson, J.B, 2005. SBA-Loan Guarantees and Local Economic Growth. Federal Reserve Bank of Cleveland Working Paper 05-03. Cressy, R., 2000. European Loan Guarantee Schemes: Who has Them, Who Pays, and Who Gains? in B. Green, ed., Risk Behaviour and Risk Management in Business Life, Netherlands. Kluwer, 30. Cressy, R. 2002, Funding Gaps: A Symposium. The Economic Journal 112, F1-F16. Dahiya, S., Saunders, A., and Srinivasan, A., 2003. Financial Distress and Bank Lending Relationships. Journal of Finance 58, 375–399. de la Torre, A., Peria, M.S.M. and Schmukler, S. L., 2010. Bank Involvement with SMEs: Beyond Relationship Lending, Journal of Banking and Finance 34-9, 2280-2293.
de Meza, D., 2002. Overlending? The Economic Journal 112, F17-F31. European Central Bank (ECB), 2014. Decision of the European Central Bank on the implementation of the asset-backed securities purchase programme. (November 19). Felix, E.G.S., Pires, C.P., and Gulamhussen, M.A., 2013. The Determinants of Venture Capital in Europe- Evidence Across Countries. Journal of Financial Services Research 44, 259-279. Garcia-Appendini, M., and Montoriol-Garriga, J., 2013. Firms as Liquidity Providers: Evidence from the 2007-2008 Financial Crisis. Journal of Financial Economics 109: 272-291. Hancock, D., Peek, J., and Wilcox, J., 2007. The Repercussions on Small Banks and Small Businesses of Procyclical Capital and Countercyclical Loan Guarantees. Working paper. Humbolot, T., 2014. Basel III and SME Access to Credit: Evidence from France. Working paper. Iyer, R. K. Kumjar, A.I., Luttmer, E.F.P., and Shue, K., 2009. Screening in new credit markets: Can individual lenders infer borrower creditworthiness in peer-to-peer lending? Working paper, National Bureau of Economic Research, Cambridge, MA. Lin, M., Prabhala, N., and Viswanathan, S., 2013. Judging Borrowers by the Company they Keep: Friendship Networks and Information Asymmetry in Online Peer-to-peer Lending. Management Science 59, 17-35. Mulcahy, D., Weeks, B., and Bradley, H.S., 2012. We Have Met the Enemy … And He Is Us. Kaufman Foundation Memeo. Ongena, S., Popov, A., and Udell, G., 2013. When the Cat’s Away the Mice Will Play: Does Regulation at Home Affect Bank Risk-taking Abroad? Journal of Financial Economics 108, 727-750. Pope, D., and Sydnor, J., 2011. What’s In a Picture? Evidence of Discrimination from Prosper.com. Journal of Human Resources 46, 53–92. Ravina, E., 2008. The Effect of Beauty and Personal Characteristics in Credit Markets. Working paper, Columbia University. Rochet, J-C., 2015. The Bank Capital Controversy. European Economy – Banks, Regulation, and the Real Sector, Year 1, Issue 1, 39-46. Stein, J.C., 2002. Information Production and Capital Allocation: Decentralized vs. Hierarchical Firms. Journal of Finance 57, 1891-1921. Taketa, K. and Udell, G., 2007. Lending Channels and Financial Shocks: The Case of SME Trade Credit and the Japanese Banking Crisis. Monetary and Economic Studies (November). Tian, X, Udell, G., and Yu, X., 2015. Disciplining Delegated Monitors: When Venture Capitalists Fail to Prevent Fraud by Their IPO Firms. Journal of Accounting and Economics (forthcoming). Udell, G., 2009. How Will a Credit Crunch Affect Small Business Finance? FRBSF Economic Letter, 2009-09, Federal Reserve Bank of San Francisco (March 6). Udell, G., 2015. SME Access to Intermediated Credit: What Do We Know and What Don’t We Know? Small Business Conditions and Finance Conference Volume. Uesugi, I., Sakai, K., and Yamashiro, G.M., 2006. Effectiveness of Credit Guarantees in the Japanese Loan Market. RIETI Discussion Paper 06-E-004. Wilcox, J., 2011. Securitization and small business. Federal Reserve Bank of San Francisco Economic Letter, 2011-22. Wilcox, J., and Yasuda, Y., 2010. Do Government Guarantees of Bank Loans Lower, or Raise, Banks’ Non-Guaranteed Loans? in Reforming Financial Regulation, Proceedings of the 45th Annual Bank Structure Conference, Federal Reserve Bank of Chicago, May 2009, 323-340, revised 2010.